We are heading into the last week of the #TourBkool, in which we are seeing as many attacks on the simulator as we are by the professionals on the streets of the real race. In addition, there are some great rides through Iceland, Australia, and part of the Tour’s Tuesday stage. The last week of competition in our particular version of the French race. You are still in time to climb in the race ranking by improving your times! 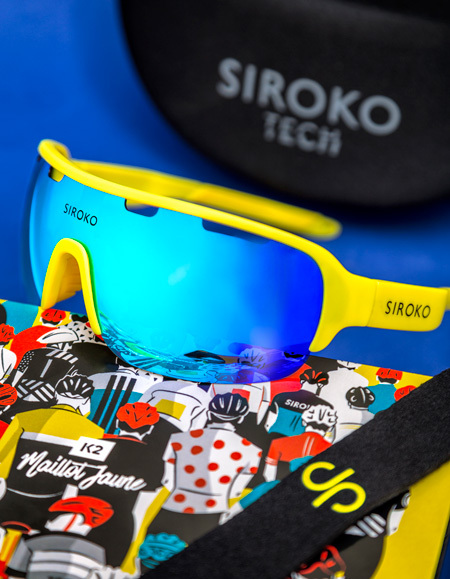 This week is sponsored by Siroko, one of the top brands in the world for sunglasses, designed for cyclists and triathletes. As always, the stage of our Challenge on Thursday will coincide with part of the actual route the professionals will ride that same day. Just for completing the stage and saving the session you will be entered into a drawing for a pair of Siroko Tech sunglasses. We have 6 to give away. Are you going to miss out? To enter the raffle is simple. Choose the time that works best for you, open the Simulator 5 minutes before to pair your trainer and sensors, go to the homepage. At the time of the event, press refresh and scroll down to the LIVE section. You’ll see a session that has a yellow box with “featured” inside. Join this session. Everyone who joins during the first 10-minute warmup and finishes the session will be entered into the raffle. DISCOUNT AT THE SIROKO STORE! Take advantage of the #TourBkool’s Siroko Week. Just for being a Bkooler, you get a discount in the store. A Pyrenean stage that runs into Spanish territory, featuring the Col du Portillon on the Bossòts slope. In this session you will rack up 11 km, starting from the small town of Les and riding 8 km, with a 7% grade on this Category-1 mountain pass. Unlike the riders who make the descent to Bagnères-de-Luchon, you will have to climb it. Pedal on the east side of the Eyjafjörður Fjord in this session that the Bkooler Gos shared with us from Iceland. You can look forward to 13 km on a stony, continuously ascending track. A 4% average incline, with some sections at 8%, make this route one of moderate difficulty. A 47-km route through the Provence-Alpes-Cote d’Azur region. Starting from the outskirts of the town of Cogolin, you will start a first stretch of 8 km, which will give way to the ascent of the Col du Canadel, a 4.5-km climb with an average grade of 5%. After the descent you will run into several climbs in a row, although of less difficulty. A section from the Indian Pacific Wheel ultra-resistance cycling race, held in Australia. In 2018 it was suspended after Mike Hall was struck by a car and killed the previous year, although some cyclists did it unofficially, to pay tribute to him. You will ride 34 km, with a slight rise along the coast of South Australia. Previous articleThe Alpe d’Huez Awaits, on the #TourBkool.